Lama Zopa Rinpoche on his first day of teaching at the 100 Million Mani Retreat in Mongolia, August 15, 2013. Photo by Ven. Roger Kunsang. The 100 Million Mani Retreat in Mongolia, hosted by FPMT Mongolia, brought together several hundred Mongolians and 70 non-Mongolian students for one month of intense practice and chanting OM MANI PADME HUM. The accomplishment of the 100 Million Mani Retreat had been a particularly strong wish of Lama Zopa Rinpoche to help revive Buddhism in the historically Buddhist country. The retreat began on August 1, 2013, at Idgaa Choizinling Dratsang in the Ganden Monastery complex in Ulaanbaatar. You can read complete coverage of the retreat in the print edition of Mandala January-March 2014. Mandala also offers additional online coverage of the 100 Million Mani Retreat from our “FPMT News Around the World” blog. See more photos from Mongolia in our FPMT Mongolia 1999-2012 photo gallery. Check out videos from FPMT Mongolia to learn about the history of FPMT’s effort to reestablish Buddhism there. Lama Zopa Rinopche upon arrival in Ulaanbaatar is being greeting by Western Sangha, Mongolia, August 13, 2013. Photo by Ven. Thubten Kunsang. Lama Zopa Rinpoche teaching at 100 Million Mani Retreat in front of photo of Jetsun Kalka Dampa, the head lama of Mongolia, Idgaa Choizinling, Ulaanbaatar, Mongolia, August 15, 2013. Photo by Ven. Thubten Kunsang. Ulaanbaatar, capitol and largest city in Mongolia with a population of 1.3 million, August 2013. Photo by Ven. Paloma. Western Sangha, Ulaanbaatar, Mongolia, Augsut 19, 2013. Photo by Ven. Roger Kunsang. Western Sangha during lunch break, 100 Million Mani Retreat, Ulaanbaatar, Mongolia, August 26, 2013. Photo by Ven. Thubten Kunsang. Lama Zopa Rinpoche with Sangha and FPMT Mongolia staff, Ulaanbaatar, Mongolia, August 29, 2013. Photo by Ven. Roger Kunsang. Sangha in Ulaanbaatar, Mongolia, August 29, 2013. Photo by Ven. Roger Kunsang. Lama Zopa Rinpoche with Sangha and flowers walking down street in Ulaanbaatar, Mongolia, August 29, 2013. Photo by Ven. Thubten Kunsang. Sangha during long life puja for Lama Zopa Rinpoche at end of 100 Million Mani Retreat, Ulaanbaatar, Mongolia, August 20, 2013. Photo by Ven. Thubten Kunsang. 100 Million Mani Retreat in Mongolia, August 30, 2013. Photo by Ven. Roger Kunsang. 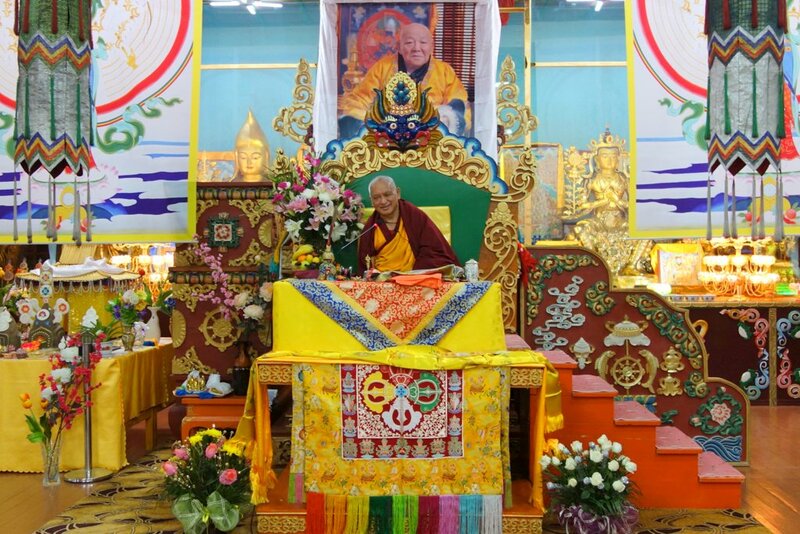 Lama Zopa Rinpoche offering teachings in Ulaanbaatar, Mongolia, September 2, 2013. Photo by Ven. Roger Kunsang. Lama Zopa Rinpoche at Drolma Ling Nunnery, Ulaanbaatar, Mongolia, September 3, 2013. Photo by Ven. Roger Kunsang. Nun who is 100 years old at Drolma Ling Nunnery, Ulaanbaatar, Mongolia, September 3, 2013. Photo by Ven. Roger Kunsang. The Soup Kitchen at Lamp of the Path, Ulaanbaatar, Mongolia, September 3, 2013. Photo by Ven. Roger Kunsang. Lama Zopa Rinpoche with Lamp of the Path staff and beneficiaries, Ulaanbaatar, Mongolia, September 3, 2013. Photo by Ven. Roger Kunsang. Lama Zopa Rinpoche watches as a woman receives care at Lamp of the Path's health clinic, Ulaanbaatar, Mongolia, September 3, 2013. Photo by Ven. Roger Kunsang. Lama Zopa Rinpoche and patient at Lamp of the Path's health clinic, Ulaanbaatar, Mongolia, September 3, 2013. Photo by Ven. Roger Kunsang. Health clinic patient made prostrations to Rinpoche upon learning of his support of the Lamp of the Path, which she says is keeping her alive, Ulaanbaatar, Mongolia, September 3, 2013. Photo by Ven. Roger Kunsang. Ornate inscribed columns at Drolma Ling Nunnery date back to 1783, Ulaanbaatar, Mongolia, September 3, 2013. Photo by Ven. Roger Kunsang. Lama Zopa Rinpoche offers blessing cords and malas, Ulaanbaatar, Mongolia, September 3, 2013. Photo by Ven. Roger Kunsang. Lama Zopa Rinpoche, Ulaanbaatar, Mongolia, September 11, 2013. Photo by Ven. Roger Kunsang. Ganden Monastery complex, Ulaanbaatar, Mongolia, August 2013. Photo by Ven. Paloma.